We are familiar with different Indias: technological India, heritage sites, or physical features highlighting its natural wonders: its water world, its mountain terrains, deserts and coastal plains. The sights are many. The diversity of its ethnicity also is remarkable. There is a need to carry this reality which is the roots and strength of India in our consciousness as we march on, in time. Suresh Khot, a product of J.J. School of Art, is projecting a charming face of India in all its simplicity and beauty. 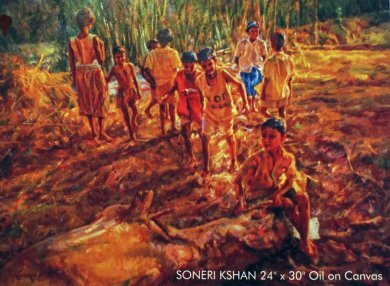 He is a freelance painter who has done solo-shows in India’s metros. 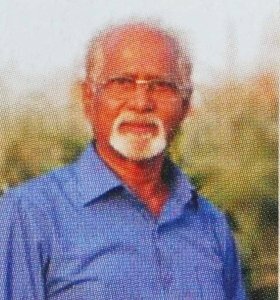 SURANGI, his painting exhibition (October 18 to 24, 2016) at Jahangir Art Gallery, Mumbai, is a testimony to his mission: paying tribute to a land still antique in its rural rhythms. Wandering away from a place he called home, his canvas narrates his memories. His chapter on life, sings how he is “lost gathering reminiscences of a fading culture,” in his words. 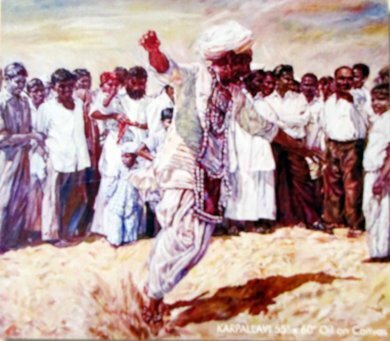 His travels through the interiors of Rajasthan and Gujarat, is the inspiration for the series exhibited. Photo-realism marks his paintings to give a touch of authenticity. 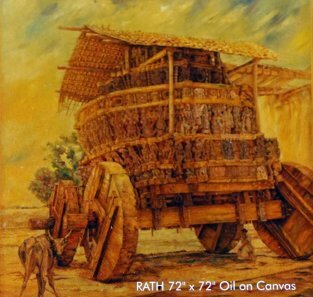 Huge in size, oil on canvas, they are visually imposing. The exhibition is curated from woman’s travails. It begins with Fruit-seller a, woman clad in a saree that matches the color of the bunch of grapes she holds. 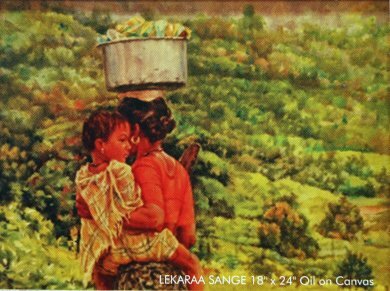 A painting that projects rural women toiling hard, symbolic of the role that today’s sophisticated techies in their air-conditioned offices still carry on. The painting of a woman carrying a head load has her child as part of her body, is a reality check. The backdrop of rich vegetation paints its rural locale. The faceless woman carrying the double burden is India’s reality. Her girl child, who looks back, is so poignant giving the message of a woman’s plight in India. The figure of the woman is not in the centre, a little to the left presents a contradiction: of moving forward in terms of work yet the retrogressive social status of the girl-child casting a backward glance. Her dress, red in color contrasts with the green of nature in abundance. Yet, they enjoy life. The group of women enjoying the noon break from hard labor is a happy phase: the bonding with others light up their lives. This is their siesta, the tonic that makes them go on. 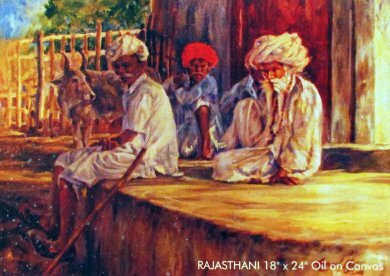 The painting of Forced Leisure, of idle men in a group is a companion piece that speaks of our patriarchal nation, of a typical village in Rajasthan. 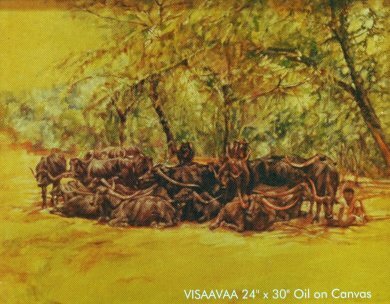 A large group of buffaloes huddled together enjoying their siesta adds a different dimension to the theme. 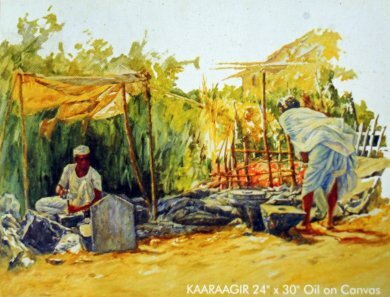 At work is a painting of a young man and an old woman bent down by life against a heap of uncut slabs, stone artifacts, utensils and implements. It brings to light a reality that still persists, with all our technological advancement, the lot of the rural poor. 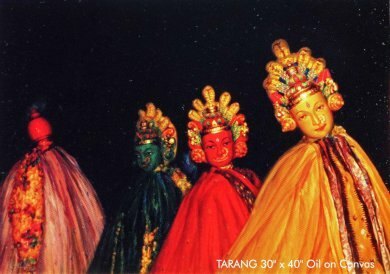 The Masked Women Dancers is the artistic face of the village. Social life is enhanced by art in our villages. Childhood induces nostalgia in viewers who had left their home long ago still pining for home, a feeling of empathy we share with the artist. 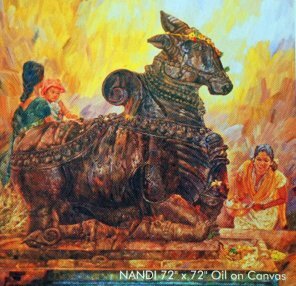 Nandi, rural India’s iconic image has pastoral and religious connotations. 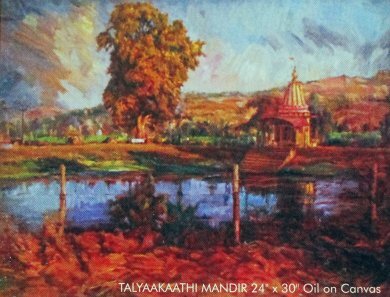 It introduces the Mandir another representation of rural India. Then we see the ritual dance of man. 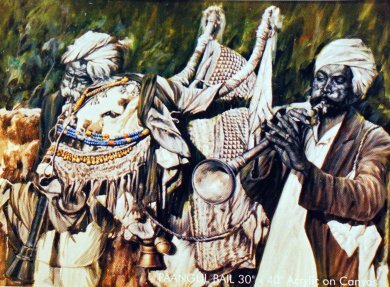 Celebrations in the villages are centered on ritual practices where males dance and play on musical instruments. The chariot, not as part of celebration, is haven where a woman and an animal rest, a refuge from the hot sun. 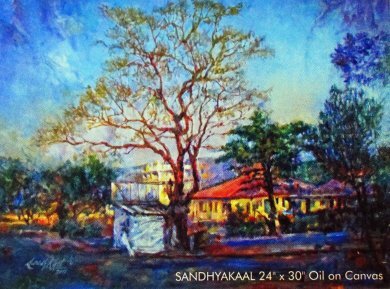 Sandyakaal is a symphony of colors. Taanga is symbolic in significance. 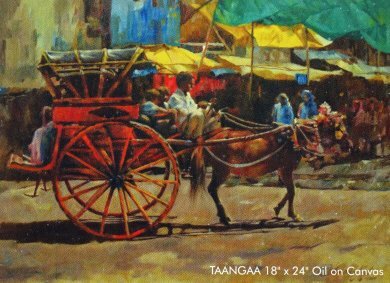 Against the backdrop of a market place, it stands for life’s journey, concluding the series as a panoramic view of rural rhythms.